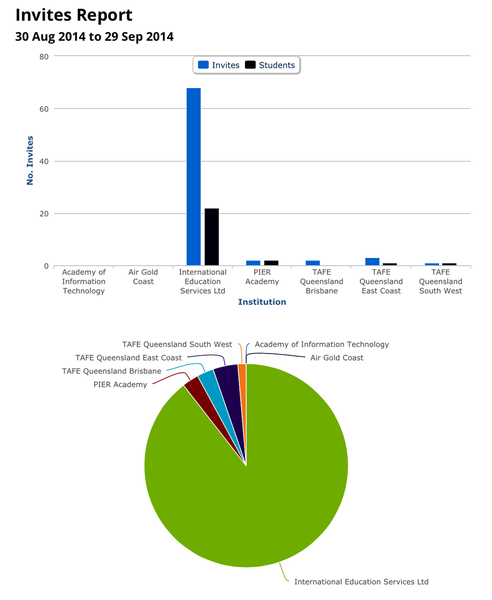 From the SWS App, click on the blue "Reports" button in the top right corner to get the education provider "Usage Report". Reports available from this tab are "Activity" and "Invites". From the "Usage Report" tab, select the date range for the report using the date fields in the "Activity" section (or leave as the default of 1 month), and then click the green "Go" button. From the "Usage Report" tab, select the date range for the report using the date fields in the "Invites" section (or leave as the default of 1 month), and then click the green "Go" button. The "Invites" report displays a comparitive graph for active invites and used invites (registered students) for the set date range.